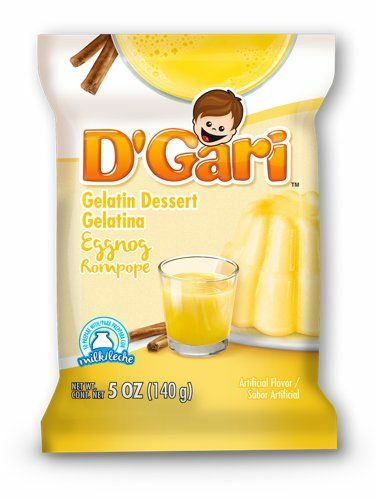 D'Gari Rompope Dessert Mix 4.9 oz. Rompope is the Mexican eggnog so traditional at Christmas time. In a large pan, mix the milk with the sugar, add the vanilla and the cinnamon stick. Bring to a boil. Reduce heat and simmer gently, stirring constantly for 15 minutes. Cool to lukewarm and remove the cinnamon stick. Beat the egg yolks until very thick and lemony in color. Then gradually beat them into the milk mixture, adding a little at a time. Return to heat and cook on low until mixture coats a spoon. Cool thoroughly. Add the rum and brand and funnel into a bottle or container that can be tightly seatled or corked. Refrigerate a day or two before serving. Serve in liquer glasses as a afternoon or after-dinner drink. Mezcla para pud�n de Rompope (crema espesa, huevos y vainilla). 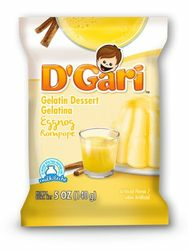 D'Gari. This gelatin is very good. I would definitely order it again! D'Gari Gelatin Unflavored 4 Envelopes (0.25 oz each) 1 oz.